If the 2016 Republican presidential primary was a bare-knuckle brawl, President Donald Trump did his best to bury the hatchet in Texas on Monday night. “Nobody has helped me more” than Cruz, Trump proclaimed, heaping praise on the Republican senator as he embarks on the home stretch of his unexpectedly competitive reelection race against upstart Democratic Congressman Beto O’Rourke. The once icy relationship between Senator Cruz and the president has thawed considerably since the tumult of the 2016 election, when the two battled it out for the Republican nomination. Since conceding to Trump and dropping out of the race, Cruz has aligned himself firmly behind the president as a reliable vote in the Senate. President Trump responded in kind, thanking Cruz for his legislative support. “Thanks to Ted, we now have a brand new member of the United States Supreme Court, Justice Brett Kavanaugh,” Trump said. Despite his best efforts on Monday, Trump’s chummy relationship with Cruz may not be as iron-clad as the president suggests. Asked by ABC News over the weekend whether he considers Trump a friend or a foe, Cruz refrained from hanging his hat on the former. President Donald Trump is greeted by Sen. Ted Cruz as he arrives for a campaign rally on Oct. 22, 2018, in Houston. “O’Rourke pretends to be a moderate, but he is actually a radical, open borders left winger,” Trump said. Departing the White House on Monday afternoon, Trump renounced that moniker and coined a new nickname for Cruz. 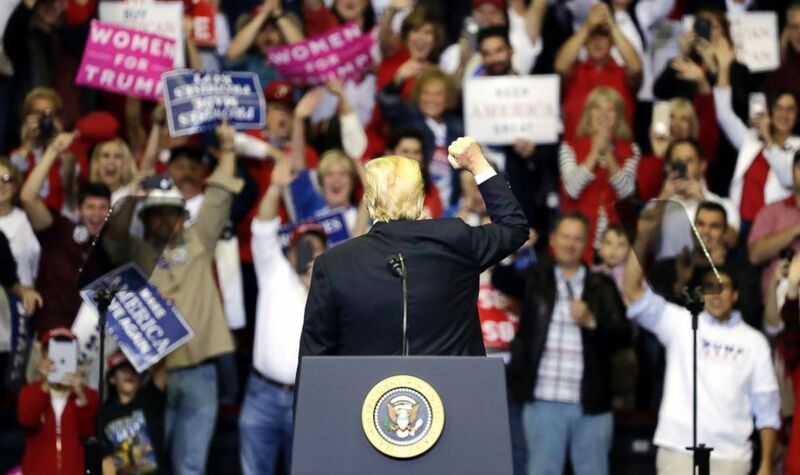 President Donald Trump acknowledges the crowd during a campaign rally on Oct. 22, 2018, in Houston. O’Rourke, who represents El Paso in the House of Representatives, also pledged to vote to impeach President Trump if given the chance. “For all middle income people 10%” the president said. Trump again claimed, without evidence, that the Democrats are behind the caravan. The total number of migrants now headed to the U.S. border is estimated to be about 7,200, the United Nations said Monday. The Trump campaign fell slightly short of that promise, initially booking an 8,000-seat arena in Houston’s suburbs. But after a “HUGE and unprecedented” response to ticket sales, Trump campaign manager Brad Parscale announced a late change in venue to accommodate a larger audience, landing on Houston’s 18,000-seat basketball arena, the Toyota Center. As President Trump took the stage, Houston’s Police Chief Art Acevedo tweeted that approximately 3,000 people watched the rally from outside the arena.